You're probably familiar with Western Astrology and how it looks at events in the sky (e.g., planets and constellations) to determine horoscopes and other aspects of astrology. Mayan Astrology also looks at the sky, but…and this is a really big but…it also looks at time. You see, Mayan Astrology doesn't just look at zodiac signs and houses to interpret events. It interprets events in the sky according to what is happening on the planet Earth at the time of the event. I don't mean that it's looking around to see if there is war going on or an earthquake somewhere, but rather that it looks at the days and years on planet Earth. 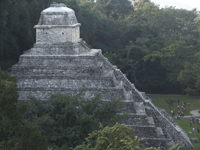 Time is at the center of Mayan Astrology. Days are grouped together to form something that looks like a calendar. The most important is a group of 260 days which forms the Mayan Astrology Calendar, or tzolkin. The tzolkin can be used for everything from determining when certain events will occur to identifying personality types. Day-Signs: These are kind of like Mayan zodiac signs. The Mayan Astrology Calendar divides the year into groups of 20 days. Each of the twenty days has its own sign, or day-sign, which reveals your personality and life purpose. The Trecena: This is another kind of Mayan zodiac sign. If you're familiar with Western Astrology, you might think of it as the moon sign. The Mayan Astrology Calendar is further divided into 20 groups of thirteen days, which reveal deeper qualities of your personality than you find with the day-signs. The Lords of the Night: Now we're getting into some pretty deep stuff. The Mayan Astrology Calendar is further broken down into groups of nine days…each named for an important god of the underworld. Think of The Lords of the Night as Dr. Jekyll and Mr. Hyde – they're the parts of yourself that you keep hidden. The Year: The tzolkin also breaks years into groups of 52 year cycles – I did tell you Mayan Astrology is really big on time before, right? So what's important about this break down into groups of years? Well, each year in a cycle has its own name and its own quality. People born in a specific year have similar qualities as other people born in the same year. Think of Chinese Astrology and its animals – Year of the Dragon, Year of the Snake, etc. The Cycle of Venus: Now, the tzolkin is looking at the planet Venus. Its cycle is divided into four periods which are used to mark the calendar. The phase you're born into tells you your social values and your role in society. …because there's one more important way in which Mayan Astrology differs from Western Astrology that you need to know about. You know how Western Astrology looks at the four elements – earth, air, water and fire? For example, Aries, Leo and Sagittarius are fire signs? Well, Mayan Astrology doesn't look at the elements. It looks at directions – north, south, east and west. So each of the day-signs is also assigned a direction, much like Western Astrology assigns an element to zodiac signs. Well, it means that just because you have the same day-sign as one of your friends. You're completely different in the eyes of Mayan Astrology because you probably have a different element for your day-sign. Your horoscope in Mayan Astrology isn't as simple as finding the month and day you were born on. However, if you take the time to put all the elements of your Mayan astrological chart together, you might find a lot more detailed information than you can get with Western Astrology.